Salts Mill & 1853 Gallery01274 531163work Art GallerySalts Mill is set in the UNESCO World Heritage Site, Saltaire. The Grade II Listed historic mill building was built in 1853 by Sir Titus Salt along with the village to house his workers. The whole area is of architectural and historical interest. 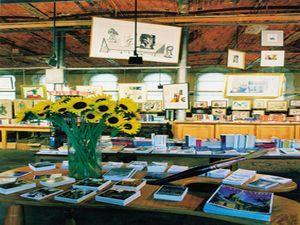 Salts Mill is home to one of the largest collections of David Hockney’s art. On the ground floor you will find the 1853 Gallery which houses a permanent exhibition of works by David Hockney. On the second floor beyond Salts Book and Poster Shop is Gallery 2 and the Saltaire Exhibition. Gallery 2 has a collection of work by Henry Marvell Carr R.A entitled “The Textile Process” and Simon Palmer’s collection of Saltaire paintings and drawings. At the rear of the gallery is the Saltaire Exhibition which is a fascinating exhibition which explores Saltaire’s history from 1853 to the present day. If you enjoy shopping then take time to explore the many independent shops in the mill which include everything from bikes to antiques. Stroll around the Salts Book and Poster shop and browse in The Home a luxury home ware and furniture shop. A popular choice with locals and visitors alike is Salts Diner, found on the second floor. If you just fancy a coffee visit The Espresso Bar (go through the Diner and turn left). On the third floor is Salts Mill’s excellent fish restaurant, Café in the Opera (open Wed – Sun 10am – 5pm). Mon - Fri 10:00 to 17:30 | Sat - Sun 10:00 to 18:00. Most, though not all, of the Mill is open 7 days a week. Different areas have different opening hours. If there's something very specific you want to see, feel free to call and check first on 01274 531163. Salts Mill is CLOSED Christmas Day, Boxing Day + New Years Day. Follow the brown signs to Saltaire and park in the village. Salts Mill has its own car park, located off Salts Mill Road, from Shipley take A6038 and follow brown signs. Using the correct postcode brings you to the wrong side of Salts Mill for the car park. Instead please set your Sat Nav to BD17 7EF and enter the site via Salts Mill Road. Proceed through the gates into Salts Visitors Car Park. Tom Tom users - Salts Mill is a 'Point of Interest' in Bradford. Saltaire railway station is adjacent to the mill.